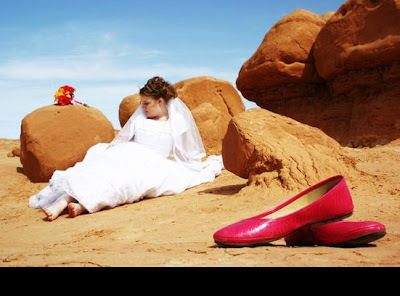 Silver Light Photography: Disasters in Portrait Photography - Episode 1: "There's No Place Like Home ..."
But I must take slight issue with your critique: the bride is not reclining in the "shade" of the rock. No, if you examine the angle of the shadow cast by the rock upon which her bouquet rests, you'd see that the shadow is behind the rock, nearly straight behind. The bride is reclining (awkwardly) on the full-sun side of that rock. Hot. Ah, Erin. Good to see you, and point well taken. I suppose a better caption might be "Cat on a Hot Tin Roof." Either way, uncomfortable, to say the least. Besides, who wears red pleather flats with a wedding dress? Dorothy? I wouldn't think so. P.S. Sherry Neal directed me here. P.P.S. The caption is perfect; just the text I thought was slightly erred.